View homes for sale in Calgary City Centre below! Real estate in the Inner City of Calgary includes a wide variety style of homes. Buyers wanting to be in the heart of Calgary have an abundance of options for condominiums, townhouses luxury homes and infill type properties to choose from. Downtown Calgary is primarily constructed of high-rise condos with many being recently built to modern architectural styles and trendy interior finishes. LEARN MORE... about the community or search real estate in Calgary City Centre. Searching for a home in Calgary City Centre or inner city? The district of City Centre Calgary is composed of 54 individual communities being recognized by the Calgary Real Estate Board as one of the largest districts in Calgary. The central district of Calgary reaches all the way to Deerfoot Trail on the east, bordered by Glenmore Trail on the south, enclosed by communities located on the west side of Crowchild trail and reaches all the way north up to the communities of Highwood, Highland Park, and Greenview. Homes for sale in City Centre Calgary often includes some of Calgary’s most expensive real estate as most high-end homes in this area are located in mature communities with tree-lined streets and within a short distance of Calgary’s downtown office district. The majority of condos are located in the Beltline area, at the northern edge of Downtown Calgary and in the upcoming neighbourhood of East Village. The inner core of Calgary is where all things usually happen in Calgary. City Centre Calgary communities offer a convenient commute to Downtown Calgary. Homes prices in this area can range from a $100,000 apartment to all the way up to and sometimes exceed $8 million. Home prices in City Centre Calgary are the second highest in Calgary. Including detached homes and condominiums, the average price of a sold home in May of 2016 was $620,000 in contrast to 12 months ago when it was only at $596,000, an increase of 4 percent year over year. 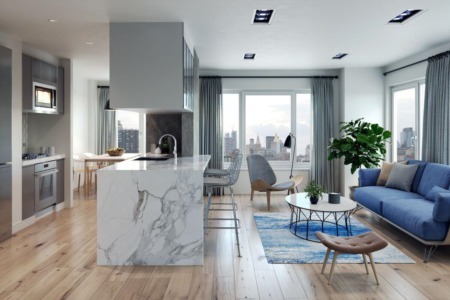 Condominium properties make up the bulk of the inner city’s real estate market and are offering many choices for condo buyers. A typical two bedroom condo in the core area of Calgary is listed for $450,000 - $460,000. While a three bedroom single-family home starts at $350,000. New listings in City Centre Calgary are worth keeping an eye on for every home buyer in the interest of not missing out on any opportunity that may present itself. Open houses in the City Centre is a popular activity for locals to explore the multitude of options that are available to them when it comes to buying or even before selling a home. In the first quarter of 2016, a total of 250 condo units were sold in City Centre Calgary for an average price of 342,000. While at the same time in 2015 the average price of a condo in the same district was $362,000 with total sales of 298 condominium units. Single-family homes in City Centre Calgary were recorded at an average sold price of $799,000 of a total of 222 properties exchanging owners between January and March of 2016 with the average size of the sold listings being 1,647 sq.ft. Year-over-year average prices have modestly decreased from $828,443, but at the same time sales have improved as there was a total of 209 completed sales in 2016 at the same time. Townhouse sales have played a significant role of the real estate market in City Centre Calgary with a total number of transactions equalling 170 listings at an average sale price of $366,000 in the first three months of 2016. In the previous year, the same figure indicated sales of 191 units with a slightly higher average sale price of $370,000. The neighbourhoods of City Centre are diverse and exquisite as it includes many different types of real estate for sale. Much of Downtown Calgary consists of office towers and high-rise condominiums in the community of Eau Claire which is famous for the splendid views of the Bow River and mountain peaks towards the west. Close to downtown Calgary in the Beltline area, apartment style condominiums dominate the city blocks with many have been recently built that are offering modern lifestyles and an abundance of amenities to today’s condo buyers. Condominiums in City Centre Calgary have been equally a popular choice for many home buyers wanting to remain close to the core or either to be able to trim down their commute time to work or just to be close to the beat of the city and enjoy all the excitement that downtown Calgary has to offer. Located in Eau Claire at the entrance to Prince’s Island park alongside the Bow River nestled several townhouses in City Centre Calgary which has been an all-time favourite for many Calgarians as these listings are usually in great demand when they go on the market. It is quite thought-provoking that as the city has grown and expanded, the average size of homes and condos have grown with it as well. It is quite common to find homes in the City Centre district that are over a hundred years old and typically they have been built between 1,000-1,200 sq.ft. on average to accommodate the lifestyle of the time. Today the average size home in the core is measured between 1,600 - 1,800 sq.ft. while the average size of a condominium built before the year 2000 was 881 sq.ft. and after the turn of the millennium, the average area of a condo increased by about 5.1% to 926 sq.ft. Luxury homes in City Centre Calgary are on the preferred list for many home buyers. The winding riverbanks of the Elbow River provide near-perfect privacy right in the midst of the hustle and bustle of the city. Communities such as Britannia, Bel-Aire, Roxboro and Elbow Park are some of the many prestigious neighbourhoods of City Centre Calgary. Parkhill, Rosedale and Briar Hill are one of the few communities of Calgary with a view of the city’s skyline and it’s not uncommon to find some of the most expensive properties in Calgary here. The average price of a luxury home in inner-city Calgary can greatly differ on a monthly basis. In 2015 the highest recorded sale of a detached home was noted at $6 million in the community of Upper Mount Royal. The most expensive condominium sold in 2015 was located in Mission and it exchanged hands for the price tag of $3.77 million. The ages of homes in City Centre Calgary frequently dates back into the early twentieth century. While many homeowners choose to renovate their homes fully, there is a greater number of homeowners and developers with the spirit of renewal in them who have decided to demolish and re-construct a brand new structure on an old lot in a prime location. A very popular style of homes that builders have built in the City Centre area of Calgary is called infills. These types of homes are also known as duplexes or attached two-storey homes. Typically a developer purchases a single lot with an old house standing on it, ready to be demolished to subdivide the lot. The minimum size requirement for an R2 sub-dividable lot must be at least 50’ at the curbside for City of Calgary’s Planning Department to consider the approval of the application to sub-divide a lot. Once the application process is completed, two infill type home (usually long and narrow) can be built in place of the torn down property. There are several new custom homes scattered throughout other communities in City Centre Calgary. Most often the price tag of a rebuilt home near the core can reach over a million dollars as the value of land makes up a significant portion of the total value of these luxury homes. Areas, where new construction homes in City Centre Calgary are being built, are usually well kept, they have meticulously maintained neighbourhoods and are located on quiet streets within the enclosure of nature. While there are a number of new condominium high-rises being built, there are still several office towers under construction in the heart of Calgary. Majority of the new development in City Centre Calgary is taking place in Downtown Calgary and primarily in the community of East Village. Going back to 2005, City of Calgary officials had started discussing the idea of redeveloping a 49-acre parcel of land which used to contain old and often neglected buildings in the area located north of Stampede Park and directly east of Macleod Trail. Since the idea of redeveloping the community of East Village was introduced, by today it has attracted development plans more than $2.4 billion and investments of $357 million into infrastructure. The land that was allocated for redevelopment had been quickly snapped up and most of the neighbourhood is already seeing high-rise condominium towers, multiple retail and office spaces are being put in place. All of the fifty-four residential communities of City Centre Calgary are among the city’s original footprint, rich with history that reaches back to the days when the early settlers conquered the West. With the arrival of CP Rail, many have made Calgary their home, yet little did they know back then about the significance of how their work is going impact this city and about the size it’s going to become. While many residents choose to travel by car, more recently the City of Calgary has been recognizing the importance of green transportation and Calgary’s Planning and Development officials have implemented a significant length of bicycle paths on many roads within downtown Calgary and various roads leading towards the office district of Calgary. Using the LRT system is also a popular alternative for many commuters as parking often tends to be a challenge in downtown Calgary. For anyone travelling within the boundaries of downtown Calgary on the C-train, the fare has been waived, making it easy for all passengers to hop on and off to take care of business quickly. Drivers heading to and from downtown have several options to choose from to escape rush hour delays in traffic. Locals of City Centre Calgary often take the back roads to bypass congested areas. Several artery roads connect downtown Calgary to the rest of the city. Some of the most recognized roads are Macleod Trail, Elbow Drive, 17th Avenue, 4th Street, Bow Trail, 14th Street heading north, Edmonton Trail, Centre Street, Memorial Drive and 16th avenue bridging the Trans Canada highway from east to west. When it comes to attractions, the City Centre of Calgary has a lot to offer. The area is home to the Calgary Exhibition and Stampede Park which attracts a lot of attention during Stampede. The park is known for the greatest outdoor show which lasts for 10 days in July. On the north side of the grounds is the Pengrowth Saddledome is located where the Calgary Hitmen and the National Hockey League - Calgary Flames play. The Canadian Country Music Hall of Fame is located in this Park as well. The Stamped Grounds also gives room for the Agricore Grain Academy Museum which attracts many tourists throughout the year. The largest museum in Canada is found in this quadrant of Calgary. It is called the Heritage Historical Village or Heritage Park. The museum is considered a first-class attraction for residents and visitors and it's one of the landmarks of the city. South Calgary communities have easy access to major shopping centres and feature many of Calgary’s condominium buildings which are conveniently located in the vicinity of downtown Calgary. One of the most desirable areas in the city, the average price of homes in the southwest quadrant are among the highest throughout Calgary.